What with all the attention diverted one set of borders east to the Ukraine, it’s quite possible Slovakia’s Presidential Election on March 15 won’t attract too much international attention. But it is, here in Slovakia, an increasingly interesting contest and one where the virtual unknown Andrej Kiska is set for a run-in with current Prime Minister Robert Fico. To put all those not familiar with Slovak politics in the picture: as leader of Slovakia’s governing party, Smer-SD, Fico has had all the money behind his campaign. This is evidenced in Bratislava by numerous billboards with Fico’s resolute face. 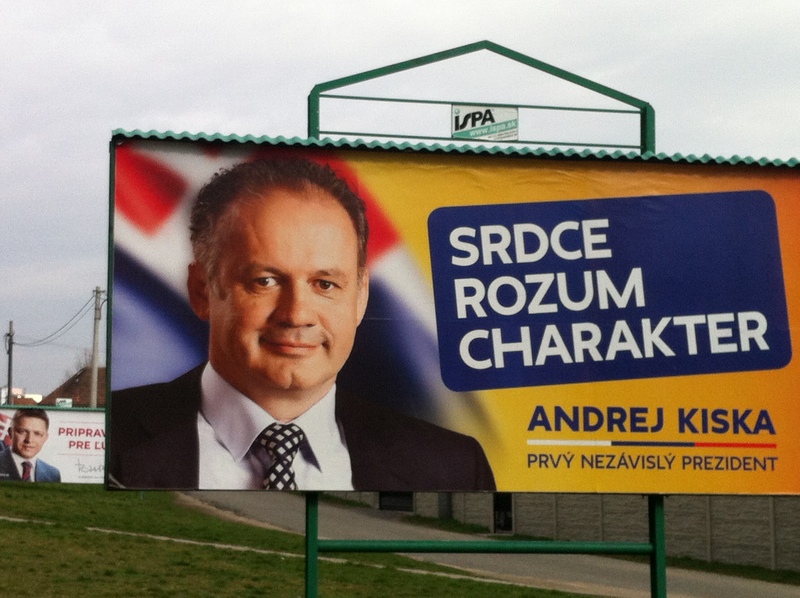 (Slovakia do US-sized advertising billboards so it can be imagined just how large that face is). Indeed, for a while this seemed to be very much a one-horse race. Early polls put Fico twenty points plus above his nearest challenger. But in January and February, Andrej Kiska has come on a pace in most polls, some of which now actually tip him to win against Fico in the second round (two of the fourteen candidates getting the most votes will go forward to a second round of voting on March 29). Try finding information out on Andrej Kiska and it’s not easy. There’s almost nothing in English and the Slovak wikipedia page on him didn’t exist until quite recently. Even the man’s own website doesn’t give very much away. What’s clear is that Andrej Kiska is a businessman, hailing originally from Poprad – a millionaire several times over who made his money in selling loans and since invested it, among other things, in charitable projects including the charity Dobrý Anjel and in stopping bribery in healthcare. All of which makes him something of a philanthropist. But not really a politician. Indeed, Mr Kiska has no political experience whatsoever. He seems to be using this as his secret weapon. He comes at this election, he says, as impartial, as an independent. It could be a much-needed quality in a Slovak political scene utterly dominated by Fico’s (centre left-leaning) Smer-SD party. And political experience is of course not so necessary for a President in Slovakia, whose role is as head of state, not head of Slovak parliament. Kiska is certainly giving the Fico Presidential bid enough of a run for its money to unnerve them slightly: there have already been a few words exchanged. More are likely to follow, too, when the fourteen Presidential candidates appear on a series of TV debates beginning March 9th (Kiska is keen, he says, to not make this debate a one-to-one between him and Fico). Kiska will also likely argue in the near future that if Fico was elected President, the power his Smer-SD party would then have (they dominated in the regional governor elections too) would be a threat to Slovakia, and that his own election as President would provide the counterbalance to Smer-SD politics. But does Kiska really stand a chance? Well, let’s just say that the billboard pictures at the top of this blog post (see Fico, much smaller, on the next billboard up?) are not directly proportional.